Machined accurate 1” x 2” x 3” steel block. Block is to be used on a table saw with a crosscut sled, so you can use your Biesemeyer T square type fence when setting lengths for repeated cross cuts. Welcome to your tool set one of the best time saving and accurate systems for cutting boards to exact lengths. The Original recliner- The Morris Chair! Many consider the bow arm to be the most comfortable of all the Morris chairs, and once you sit in one, you’ll see why. Made of hand selected quartersawn white oak, the beautiful arms are 1″ thick and a full 6″ wide, perfect for any beverage cup. The seat cushions are upholstered and ready for the leather or fabric of your choice. The adjustable back works with simple wooden pins. The pins can be fit into holes making back recline to angle of your choice. Also included is the matching footstool and corresponding cushion. 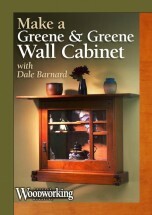 This Greene & Greene inspired blanket chest was inside Dale’s mind for a long time. 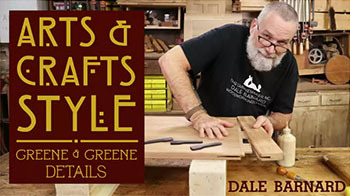 During decades of building Greene & Greene inspired reproductions in furniture, kitchens and anything else lots of design ideas had been developed but no time to build them. Finally found the time! Dale now has his new blanket chest design ready to sale. the stair stepping proud finger joints in graduating thickness brings to mind G&G fireplaces and outside stone work. The wood is mahogany on the outside with ebony plugs & splines and boasts of an aromatic red cedar tray on the inside. The tight hinges hold the top in it’s position preventing slamming on little fingers. Dale’s G&G Tall Clock that was featured in the Indiana Art Museum. The primary wood is African mohogany with gabon ebony plugs. The face is mahogany veneer with hand carved cocobolo numbers. Even the back is mahogany with a unique interlocking access door. The dyed finish is hand rubbed lacuer and paste wax. The high quality movement is made in Germany by Hermle and plays 3 tunes or can be silent. It is an 8 day cable movement. Our Signature Piece, this Greene & Greene wall cabinet is in stock and ready for shipping to your home. This design was inspired by the wall cabinet in the Thorsen House dining room. Many of the unique features the G&G brothers are famous for are incorporated into Dale’s design. The handle is custom made. The cabinet is completed, as you see, with stained glass, etc. Designed to be screwed to the wall studs, at whatever height you prefer. Included is a finished strip of mahogany to hide the screws. Slightly oversized for a snug fit into mortise, these handmade plugs are approximately 3/16″ deep with back bevel on inside edges for easier insertion. We recommend water based wood glue, and tapping into place with a rubber mallet. If your Arts & Crafts home seems to be missing something, it could be this beautiful tall clock. There is something nice about sounding out the time every 15 minutes that connects us to the historic period of this clock. It will become part of the family. The movement is a cable wind, three songs and silencer, 8 days without winding. Top quality case, with true mortise & tenon joinery with quality quartersawn white oak with a slightly aged finish. The “coffee table” didn’t exist when Charles and Henry Greene were designing, but craftsman Dale Barnard saw the need and went to the Gamble House’s Tsuba-shaped dining table for inspiration. What’s a Tsuba? the hilt guard from a Japanese Samurai sword; the same influenced Charles Greene so much that he used it in many furniture designs and Dale adopted it here. Massive thick solid wood base with shaped lines is a regined design that contributes to the overall elegant look. It is a great centerpiece for any living or family room.